Everyone likes to feel appreciated. Being recognized for the work you do fends off resentment, increases contentment, and yes, makes you want to work even harder. That’s why wishing someone a happy work anniversary – one of the most basic forms of employee appreciation – is so important. 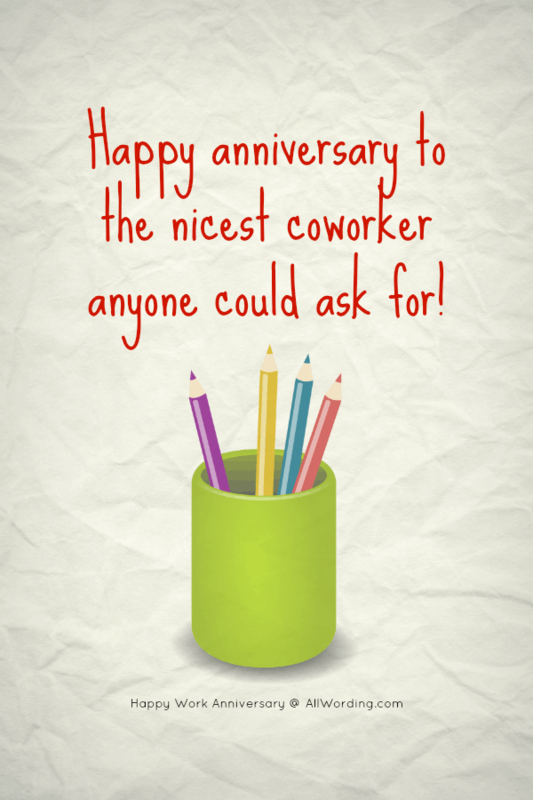 Here are some thoughtful work anniversary messages you can send to a coworker, boss, or friend. Whether you’re looking for a message to share on social media, in a greeting card, or in a humble text message, these wording ideas will help you come up with the perfect sentiment. To start, here are some work anniversary wishes that work for almost any situation. Happy work anniversary! Thanks for everything you do around here. This place wouldn’t be the same without you. Happy work anniversary to the nicest coworker anyone could ask for! Another year of excellence! Thanks for all the amazing work you do. Your effort and enthusiasm are much needed, and very much appreciated. From all of us… happy anniversary! Thank you for your hard work, your generosity, and your contagious enthusiasm. Congratulations on your work anniversary! We appreciate your energy, your kindness, and all the work you do, but most of all, we just appreciate you! I couldn’t let your work anniversary pass without sending my best wishes. How lucky am I to work with someone I can truly call a friend? [Non-Coworker] Happy work anniversary! They are truly lucky to have such a smart, thoughtful, and talented person like you. [Self] Today marks the 6th year I’ve been at this job. To all the great people I’ve met and worked with… thanks! It’s been a wild, wonderful ride, and I wouldn’t have it any other way. [Boss] I hope you celebrate many more anniversaries here, because I don’t like my chances of getting a better boss than you. Here are some special wording ideas for the big milestones. Congratulations on your 1-year work anniversary! You’ve accomplished a lot in the past year, and I can’t wait to see what you do in the future. Happy 1-year work anniversary! You are simply awesome! Congratulations on hitting the 5-year mark with the company! Hope you stick around for many more because you’re one of the best! It’s your 10-year anniversary! Thanks for being part of our family for a full decade. It’s hard to imagine this place without you. Happy anniversary! The company has changed a lot in the 20 years you’ve been here. I’m sure you’ve seen and done it all. And yet you still treat every day like its your first day on the job. Thanks for all the hard work that started 20 years ago and continues to this day. Has it really been 30 years since you started here? I guess time flies when you’re having fun. Thanks for your years of service, your hard work, your dedication, and for everything you’ve done to make this company what it is today. 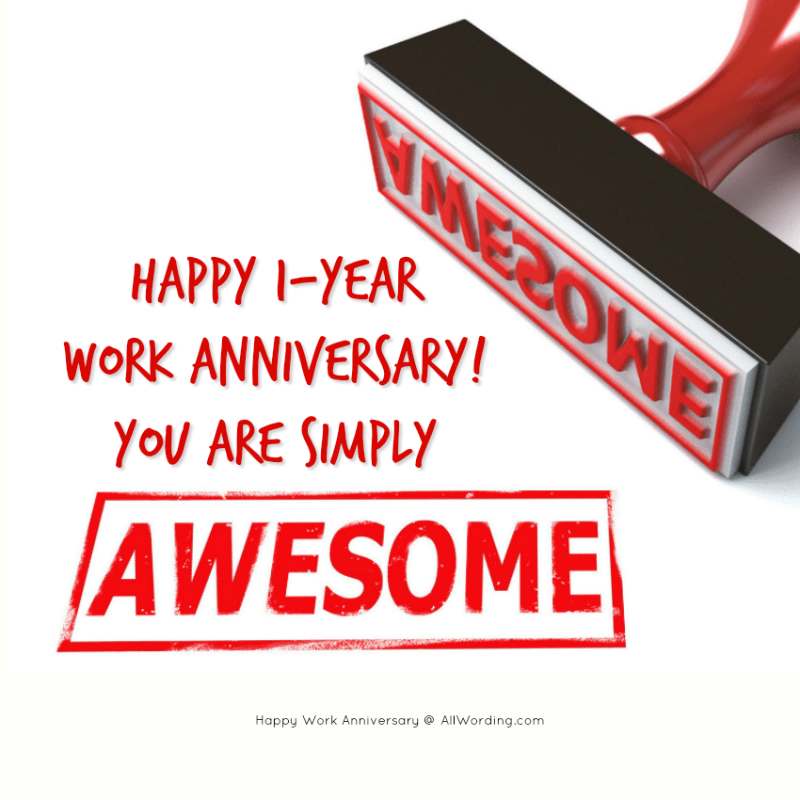 Finally, here are some humorous ways to wish someone a happy work anniversary. It goes without saying that you might not want your employer to see you sharing messages like these. Happy anniversary to an employee who has made invaluable contributions to this company. Now get back to work! Congrats on surviving another year at your job. Lesser mortals would have gone insane by now. Happy work anniversary to a coworker who has many talents, including the spooky ability to sense when there are donuts in the break room. Happy work anniversary! Don’t you dare think about taking another job – but if you do, please take me with you. Congrats on another year of thankless work. It’s taking them much longer than expected to bleed you dry. People like you make this company what it is. And I mean that in a good way – really! Want to go even further with your message of appreciation? Consider sending a humble gift of candy with one of these clever sayings.